Magellan is basically Trent and Wayne Gardner, with Robert Berry adding some touches as well. Innocent God is their seventh studio release from 2007. 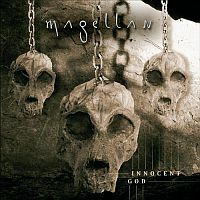 As one of the first bands to include metal into their mix of progressive styles, Magellan’s sound kept changing little by little with every release, culminating with the dark Symphony for a Misanthrope. Having bought their previous 2 albums and going against the progressive crowd grain thinking they were getting better and better, I had high expectations of this. The very first few moments let you know that this is going to be slightly different yet again to the previous releases, with Magellan unleashing a furious and direct attack on your system. There’s no beating about the bush here, it’s certainly much more in your face than most of their music. The melodies are constantly at the forefront with very little typical prog elements, like extended synth solos and guitar wankery. Still, you could say this is stylistically their most diverse album, with the guys incorporating elements of electronic music (samples), melodic rock, industrial music, soul and world music into the mix. But at the forefront is the melody, in whatever shape or form. Of course, mostly we hear the usually gritty rock and metal sound the band has become famous for, but the inclusion of all these new elements makes this album sound totally new and exciting, while being totally approachable to people not familiar with their previous material or progressive music in general. The CD is perhaps one of the least liked from their catalogue among the prog rock crowd, perhaps mostly due to a more accessible character of the songs. It's almost as if you're watching Kansas during the Monolith period – cutting back on some of the lengthy solos and getting back to basics. To me this is not a negative thing and I think it actually suits Magellan's music best. Trent Gardner proves himself not only as a great singer for this type of music, but also as a fine song-writer in this style, writing one exquisite tune after the other. Don't get the wrong idea, this is still full of proggy moments, but definitely not as much “banter” between the musical clarity. We eagerly await their next release!